My last several posts, e.g. here, have discussed the question as to whether or not the U.S. economy can grow faster. Even though there are many headwinds to faster growth, there are still various measures to take which will help significantly. Beyond specific policy directions, such as aiding small business and cleaning up and simplifying our tax code, another very important step is to get our fiscal problems, i.e. massive debt, under much better control. Personal Responsibility for Retirement Savings. The idea is to move toward turning Social Security into a universal flat benefit for all U.S. residents age 65 and older. Anyone could supplement this basic income with additional private savings. Market Discipline in Health Care. The idea here is to keep the ACA exchanges with subsidies for low-income households. Employer provided care would have no mandates and a rational and equal tax credit for all. Health Savings Accounts would be liberalized to encourage widespread participation. Both Medicare and Medicaid would provide premium support for basic care. The point is to bolster the consumer’s role in the marketplace in order to slow down the rising cost of healthcare. Promotion of Work for Safety-Net Programs. 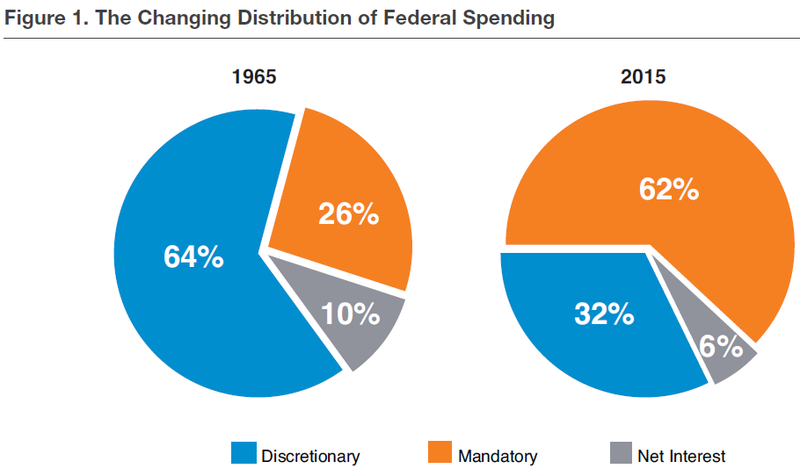 The federal government spends about $400 billion annually to fight poverty (not counting healthcare programs) with much overlap of federal and state programs. Reform efforts should emphasize work as the key to improved economic prospects as well as greater state control over resources to allow for better coordination of efforts. Two major reform concepts, block grants to states as well as wage subsidies, should be implemented. We have to get our fiscal house in order, so entitlement reform is not optional. Delay, moreover, could be catastrophic. If we wait until another crisis hits, then it will no longer be possible to design reforms with gradual adjustments. Now is the time to act! This entry was posted in American Enterprise Institute, debt, deficit, economic growth, entitlement reform, entitlement spending, entitlements, Jack Heidel and tagged debt, deficit, Deficit spending, economic growth, fiscal responsibility, jack heidel by jackheidel. Bookmark the permalink.